Unless You murdered Someone on New Year’s Eve in Las Vegas, You got to sleep in Your own bed or the bed at the hotel. Las Vegas sells more alcohol than any other City in America on a daily basis. You can see People drinking at 6am that have been drinking all night and see People drinking at 9am that are just getting started. No other City has this type of consumption that is welcome by that City. But When I found out that 4 arrest for DUI were made on that New Years Eve/New Years Morning that really is a poor example of good Police work. Normally the Las Vegas Police are on top of their jobs but this certainly proves that they were given orders from the top to keep it safe and only arrest People on a very necessary basis. Not only were there only 4 DUI’s there were only a dozen or so other total arrest and those were misdemeanors. A year ago there were 60 DIU’s. Did Everyone just decide not to drive drunk on December 31, 2013? Wouldn’t that be nice? 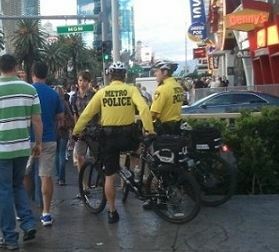 350,000 were partying in Downtown and on the Strip and 4 People were driving drunk? Wow! Impressive! In Cities around the USA roadblocks are set up and 100’s are given DUI’s and that is common in Cities of small population and no tourist. You might say that most of the 350,000 People were walking, not driving but You would be surprised to know that only about half of that number didn’t get in a vehicle that night, that leaves a whole lot of drunk People driving.